Traditions and mysticism have always had a deep connection with the Romanian and Rroma culture. The connection with the divine has influenced these cultures starting from their creation until our days. Furthermore, the foundations of our traditions are set by the very belief in a more complex meaning of things, and on the purity of the simple and yet strong meanings of the everyday gestures and objects. By diving into the history of architecture and of manufacturing on the Romanian territory, we can realize patterns repeating themselves: Connection to nature, to the divine, beliefs, superstitions. A craftsman is like a sculptor that materializes the archetypes of its culture and history in a way for his fellow men and women to be able to touch and feel or wear the sentiment of belonging to their community. It was like this before and it still is like this despite the technological age. The main difference is the way the art of manufacture is integrated in modern society. One very ingenious way to do this is creating the Mesteshukar Boutique, which unites modern times with faith and traditions. The best way to celebrate and to create this union to its full potential, is in my opinion to showcase it in a way that permits the visitors to understand the origins of the Romanian and Rroma cultures, that have a common connection to spirituality. In order to bring down to earth, the abstract idea of the archetypes of our cultures, the space has to be open and fluid. The front part of the shop is the main exhibition area - the products are exposed inside and hanging from the walls. This linear display is broken on the left by a low table placed in the middle axis of the wall, with the possibility of seating. 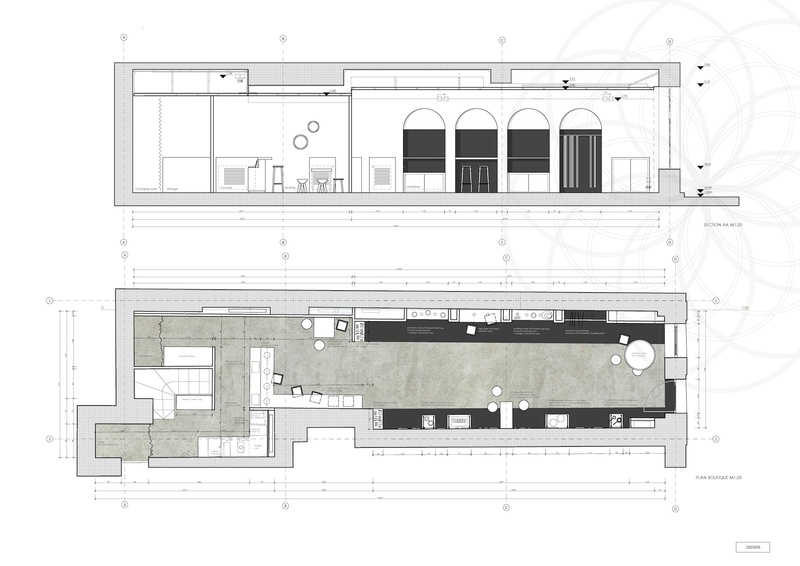 The middle area is left free creating a big passage that leads directly to the bar and provides the possibility of accommodating workshops. The following area is mainly the seating area, where the visitors can enjoy coffee specialties. The two areas are merging into each other and borrow elements from one another – exhibits on the bar table, seating and bar tables in the exhibition area. Behind the counter, the space splits into two areas – the coffee shop and the back office with a changing room for the boutique. Both share the same counter. 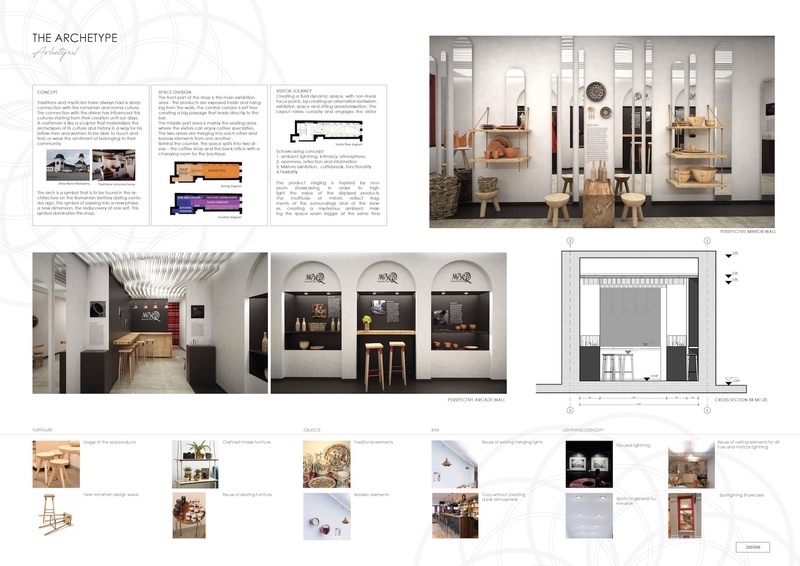 On the right side, four cut-in arches are creating an intimacy that allows the visitor to connect with the product and observe it in a more focused manner, thanks to the depth of the shelfs, the dark background and the warm lightning. On the wall, information and images related to the exhibits can be printed. On the left side, the wall is decorated with high and thin mirrors that recreate the arch symbol. This is a symbol that is to be found in the architecture on the Romanian territory dating centuries ago. It is the symbol of passing into a new phase, a new dimension, the rediscovery of one self. This symbol dominates the shop. The multitude of mirrors reflect fragments of the surroundings, creating a mysterious ambient, making the space seam bigger at the same time. The exhibits are hanged on the walls in a very non-intrusive manner to give the space legerity. The lightning in this area is not specific, giving a more natural feeling to help imagining the products in our own homes. The layout of the space and showcases is flexible, permitting to easily switch the position of the product categories – for example: new or special products can be highlighted in the focused exhibition area on the right-hand side. Moreover, the number of products on display can vary, by adding or taking off the hanged shelfs. The bar tables can also be used as display areas.